2019 Average Cost to Install a Wood Fence: How Much Does Wood Fencing Cost? Need a Wood Fence Pro Near You? Find Local Wood Fence Installation Experts & Get Free Price Quotes. No Obligations & No Credit Card Needed. Fencing is synonymous in the minds of many American homeowners with a white picket fence encircling a home. While this type of wood fence is indeed popular in the U.S., wood fencing is available in a multitude of other styles, each of which contains the unique characteristics of wood as a building material. This buying explains why you should consider wood for your fencing project and provides an overview of wood fencing costs. Cedar, redwood, spruce pine, yellow pine, cypress, and Douglas fir are the most popular varieties of wood used in fence building. Each varies in strength, resistance to rot and insects, amount of sap and knots, clarity, and price. The four major components of a wood fence (cap, rail, post, and picket) can be arranged into virtually limitless design variations. The following fence styles, however, are among the most popular. Picket fence: Picket fences are a good choice for front yards and gardens. Pickets are usually spaced relatively far apart, which makes them ill-suited for privacy, but they are difficult to climb and provide adequate security. Vertical board fence: Vertical board fences are usually at least 6 feet tall and provide varying levels of security depending on how much overlap there is between pickets. They additionally offer good wind and noise protection. Lattice fence: The crisscrossing boards of a lattice fence provide decent security and are ideal for climbing plants. Consider it for your garden, patio, pool or other backyard sanctuary. Post and rail fence: Post and rail fencing is good for forming boundaries on large properties. They can be used to create a country ranch style or serve a more utilitarian purpose and actually corral livestock. Two, three, or four rails are common. Classic beauty: Wood has been the fencing material of choice in America for more than 400 years. There's a simple elegance to wood fencing that connects us to our colonial roots. Cost: When compared to metal and vinyl, wood is relatively inexpensive. Sure, there's more maintenance, such as staining and painting, involved, but this allows you to change colors and finishes if you'd like (not to mention channel your inner Tom Sawyer). Options: Wood fences are very popular, but the many available types wood, styles of fencing, and colors make it possible to express your individuality. The following wood fence prices are only general estimates. Actual prices may vary based on local labor and material costs, the difficulty of the installation, and other factors. For the most accurate wood fencing costs, fill out the form provided to receive quotes from prescreened fencing contractors in your area. Wood fence costs are generally around $10 to $30 per linear foot installed, but could be as much as $100 or more per linear foot. 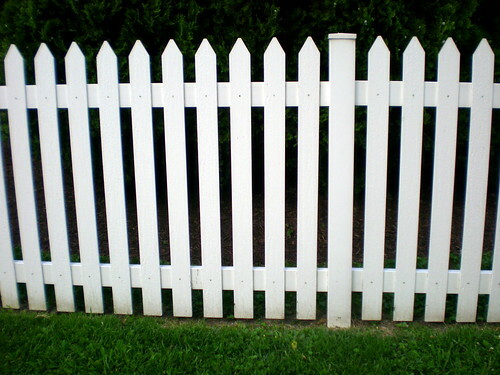 Picket wood fences cost anywhere from around $10 to $40 or more per linear foot installed. Split rail wood fencing costs approximately $10 to $30 per linear foot installed. Lattice wood fencing cost per foot might be $20 to $60. A vertical board privacy fence could be as little as $10 per linear foot or as much as $100+ per linear foot installed. A wooden fence gate costs around $100 to $1,000 or more.